Prepare yourself to Move your body & your soul with a Chic and Shuffle Beat !!! Make a trip with the Nu Sound. Dress code : White + Silver + Bring to the light !!!! OKB Dj's and More Special guests !!!!!! Dress code : White + Silver + Laser Lizm !!!!!!!!!! 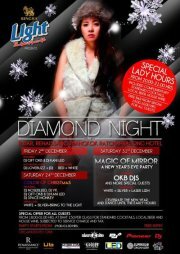 • Lady hour from 20.00-21.00 hrs., included complimentary standard cocktails, local beer, house wine. • Special offer for all guests from 18.00-01.00 hrs. at Baht 150 per glass for standard cocktails, local beer, house wine, subjected to service charge and tax. • Free Bar (From Singha Light) 19:00-10:00 hrs.